Several months ago I attended a cooking class by my cousin Barbara Sibley, chef/owner of the La Palapa Restaurants at the Culinary Loft in Soho. The food was delicious and the class was fun. But, I found it to be particularly successful in clarifying and demystifying the ingredients and techniques of authentic Mexican Cuisine. I love Mexican food, but before this adventure, my culinary repertoire generally required cellophane wrapped items found in the "snack food" aisle of Stop n Shop. 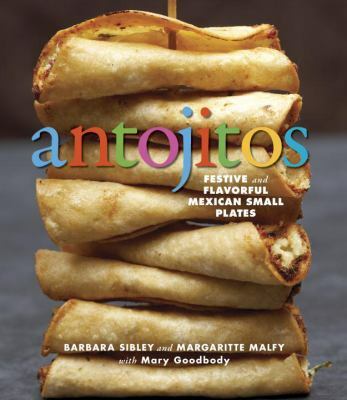 Following the class, I wanted to try some recipes at home and write about them, but the miserable cold winter that lasted until last week did not exactly inspire me to dive into a day-long marketing and cooking marathon exploring the recipes in her new book Antojitos: Festive and Flavorful Mexican Appetizers. But, Amanda came to Connecticut this weekend with some of her (and my) favorite longtime- buddies, and requested fajitas for dinner, immediately after I submitted a review of Costa Careyes in Jalisco, Mexico to Jetsetter (I will update when the sale goes live), I immediately grabbed the book and headed to the SoNo Country Market in Norwalk. In addition, I have been excitedly enjoying creating and adapting recipes using a wonderful new product: Jack's Gourmet Sausages, which come in Chorizo, Italian, South African, and other Varieties. Supersol and Park East Kosher stock them. And now you can order ONLINE! Click link above. I encourage you to visit La Palapa, or to get the book, but here is the menu and a couple of the recipes, in red. note: for most recipes it will be pretty hard to avoid visiting a market that stocks the required items, or order online. Mix masa harina and salt. Slowly add the water, working into the flour to form dough. Knead 3-5 minutes until moist and smooth. Divide into 12 equal balls, and pat into thick disks. Cook disks, a few at a time, on a hot griddle on medium high heart, turning once for about three minutes on each side until a golden brown crust forms on each side. As you remove them, (careful, hot), use your thumbs to pinch the edges up and the center down, creating a rim. Heat about 1" of oil in a skillet until hot and a small piece of dough sizzles on contact, and gently fry the chalupas, turning once, for about 2 minutes on each side until crisp and golden. Do not brown too much or they will toughen. Lift from oil, drain on paper towels and fill immediately, or wrap tightly in an airtight container at room temperature for up to three days, and reheat in a dry skillet or griddle, or microwave on high, 15-30 seconds. In a skillet heat oil and add chorizo breaking up into small pieces until well cooked, 5 minutes. Reserve. Warm chalupas as above, and arrange on platter. Fill each "cup" with a Tablespoon of Cooked Chorizo, and top with 1 teaspoon salsa, a dollop of crema, and a good sprinking of cheese, onion, and cilantro. Serve with guacamole if desired. *Jack's kosher chorizo is quite spicy, and salami-like. I cut it into 1/4 inch pieces, fried it well with an equal amount of ground beef, and drained off the rather shocking amount of fat in a strainer. This comes very close to the taste and texture of real chorizo. for the vegetarian version, I cooked Soy-Rizo in a skillet, and since that too was very strong, I added about half a can of black beans. This would also be a good combination for Tostadas. In a blender or food processor combine the tomatillos, cilantro and chiles. Pulse, adding a bit of water at a time until a coarse puree forms. Transfer to a glass or ceramic bowl and add chopped onion and salt to taste. Can keep up to 5 days in fridge. In a small bowl combine jicama, orange juice and 1/2 tsp. salt, toss and refrigerate up to an hour. Line salad bowl with romaine leaves. Mound jicama/fruit mixture in the middle and sprinkle with lime juice, salt to taste, and just a sprinkle of the chili powder.